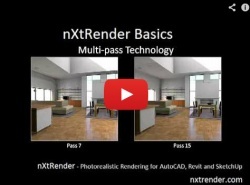 This video, taken from a Webinar for the nXtRender/IRender/AccuRender nXt Engine explains some of the advantages of multi-pass rendering. Multi Pass rendering lets you quickly see what your rendering is going to look like – after the first few passes – and the either change settings, or let the rendering continue go get better. In this video Scott Davidson shows you how multi-pass rendering works for nXtRender for AutoCAD, Revit or SketchUp.